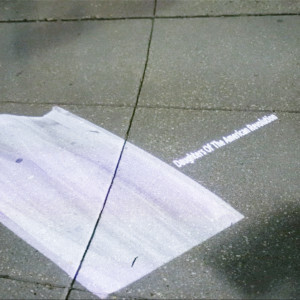 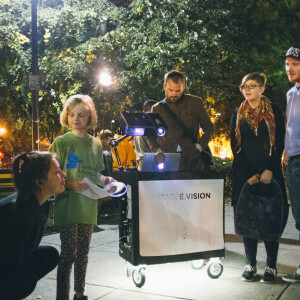 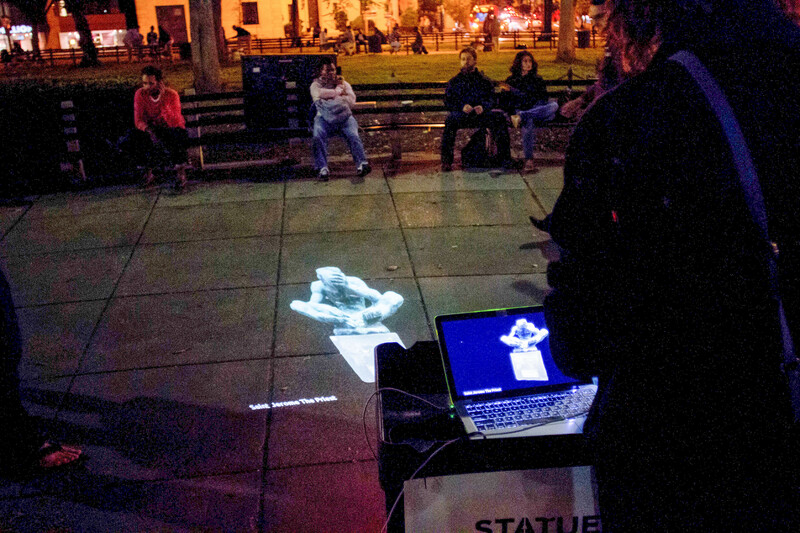 Statuevision is an interactive public projection performance and digital statue archive that engages citizens in conversations about urban histories by re-contextualizing familiar historical monuments. 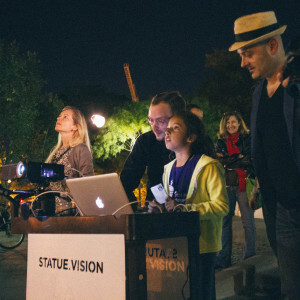 Statuevision uses the historical statues found within a city as a platform for community storytelling, interactive learning and inspiring engagement with public art. 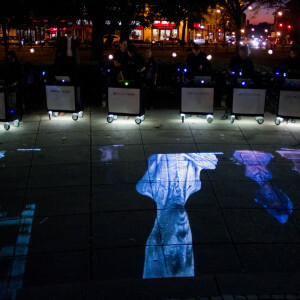 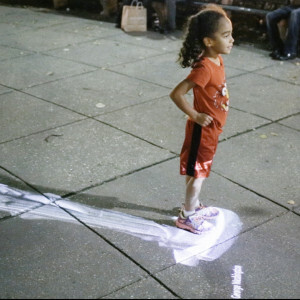 The narrative of each individual figure represented in a monument, as well as the larger community history, is reexamined through the lens of a projector during a public participatory performance. 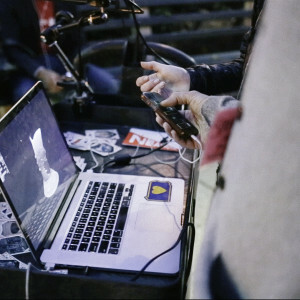 All content gathered and created for the event is a digitally archived and available online for anyone interested. 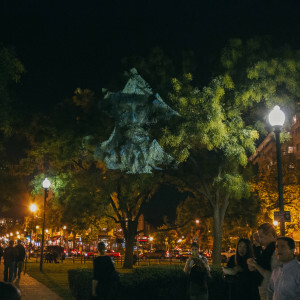 The one-night public performance starting at dusk at Dupont Circle Park surrounds Chester French’s statue. 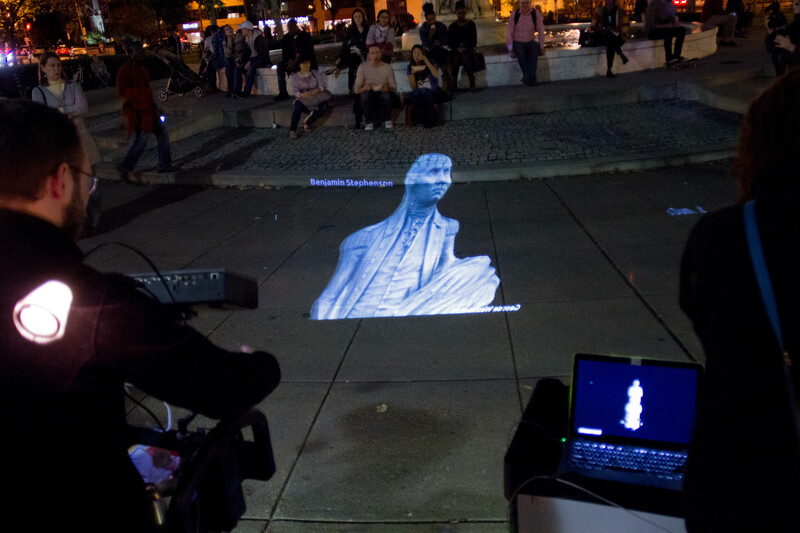 The event assembled approximately 50-500 DC citizens and visitors to experience live, real-time interactive projections based on 3-dimensional models of District statues. 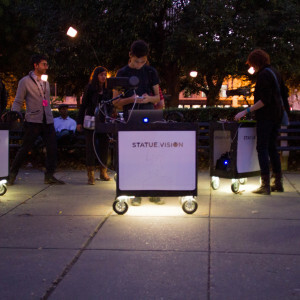 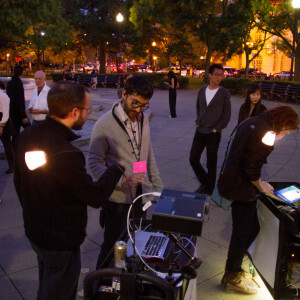 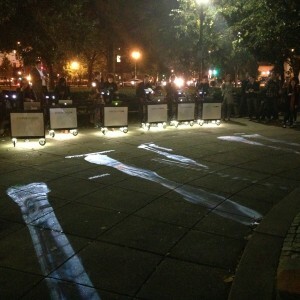 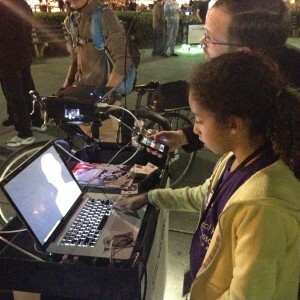 Utility carts on wheels allow performers to move about and project on trees from small battery powered projectors. 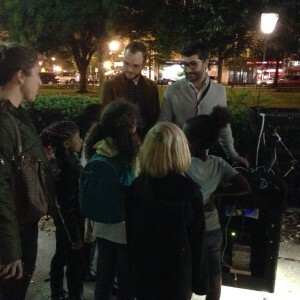 The project involved local history teachers and historians, young students form Capital Hill Montessori, students from Carnegie Mellon University and everyday DC history buffs narrating the lives and achievements of historical figures commemorated in statues around the district . 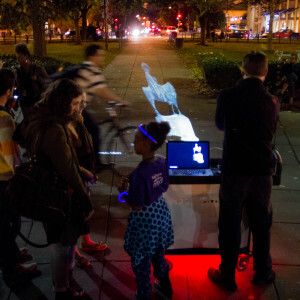 The piece explores the future of movements and monuments, and Dupont Circle as a place for gathering and assembly, in celebration of public monuments and the histories they embed. 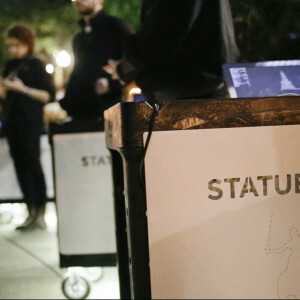 Statuevision transforms the uncanny, heroic, referential legacies of statues as a means for reframing monuments can become instruments for public imagination and social vision. 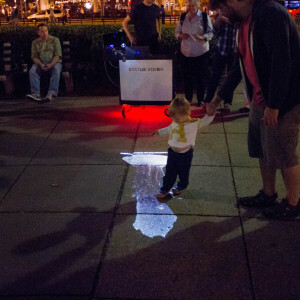 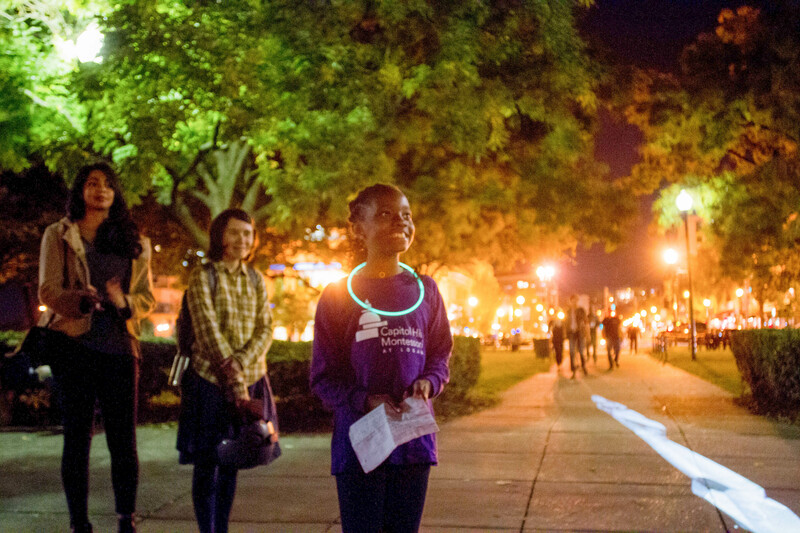 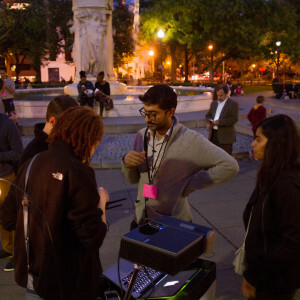 The performance highlights Dupont Circle’s legacy as a place bridging local and global culture in Washington DC through congregation, social diversity, and public exchange. 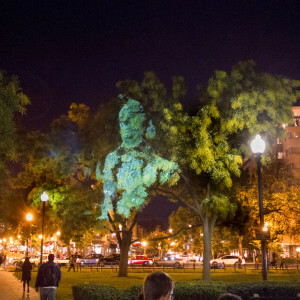 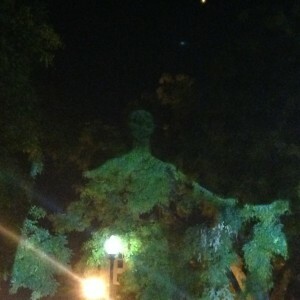 Statuevision populates public imagination with an inclusive illumination of the center statues, accompanied by projections of public statues from other parts of DC on surrounding trees, and its beautiful political messages to the people as explorers. 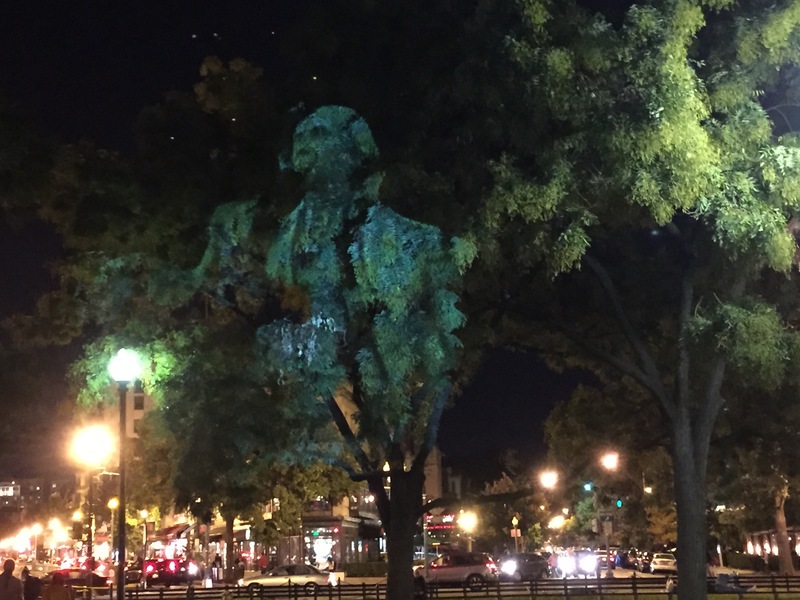 Participatory public projection performance about the past, present and future of our nation, seen through the lens of historical figures commemorated in statues around the district. 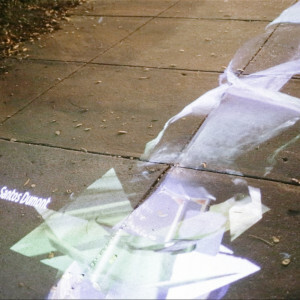 Social and Learning Media design and production: Claire Hentschker. 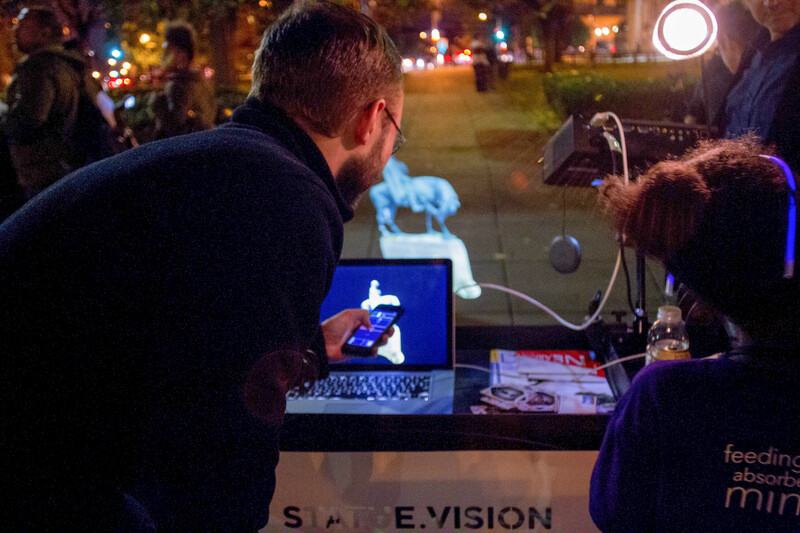 3d Modeling: Rob Hackett, Lauren Valley, Claire Hentschker. 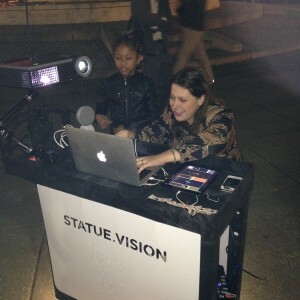 Statuevision was commissioned by 5x5; this portion of 5x5 was curated by Stephanie Sherman.